Laravel Scout makes it very easy to setup an external search engine to create consumer-grade search quickly. The package comes with Algolia as a default search engine. I&apos;d like to demonstrate how to make use of the geo-location search feature with Scout. In this tutorial, you&apos;ll learn how to prepare your data for Algolia and Laravel Scout to retrieve items based on location. For this tutorial, I quickly set up a Laravel app with dummy data of airports around the world. You can find the project on GitHub. You can install it by following the notes in the readme. If your use case is different or your data isn’t organised this way, feel free to post to our community forum. Scout comes as a separate package, we&apos;ll use composer to pull it into our project. The whole point of Scout is to add an abstraction layer so your code will be the same for any search engine you choose. Since we&apos;re using Algolia, this will require our PHP client. Once the PHP client is installed, let’s configure our configuration and specify Algolia as a search provider.. Simply open up the config/app.php file and add Scout in the providers array. Lastly, publish the package configuration. You don&apos;t have to edit the file, everything can be set in your .env configuration file. Now, open up your .env file and add your Algolia credentials. You can find these details in your Algolia dashboard, under the API keys tab. Algolia’s storage is schema-less, meaning all your data will be represented as a JSON object. 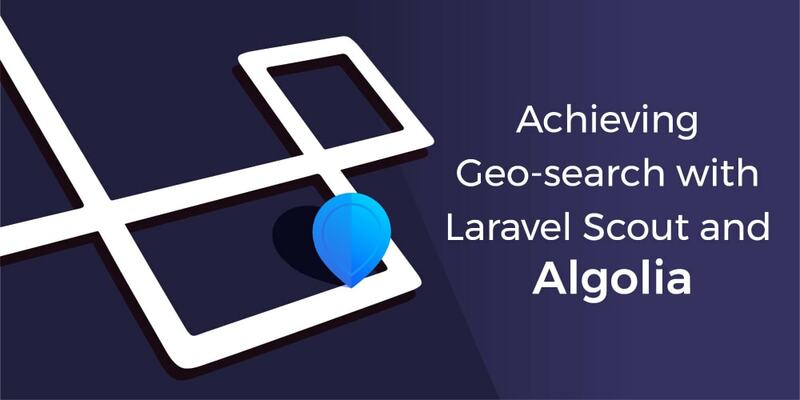 Laravel Scout transforms your model into an array before sending data to Algolia, using the method [toSearchableArray()](https://laravel.com/docs/5.4/scout#configuring-searchable-data). So we&apos;ll simply override this method to set the _geoloc attribute. Once it&apos;s imported, you will see your data in your Algolia Dashboard. Because we use the Searchable trait, we can use the search() static method to look for our data. The good news is that search() takes a callback as a second arguments to alter the request made to Algolia. We&apos;ll hook just before step 1 to search by locations. You need two pieces of information to search per location: the coordinates and a radius. This is what we&apos;ll pass to Algolia using the callback. Let&apos;s say we want the airports around Paris. In this example, we&apos;ll not search in the text, but only per location. Hence, we&apos;ll leave the query empty. By default, Algolia returns the results sorted by ascending distance: the closest comes first. The radius is, in fact, optional. If you don&apos;t provide radius, Algolia will return the closest 1,000 results. If you want to know more about how to set the options to search by location, you can refer to the official documentation. Algolia can also search inside a zone. A zone, called a bounding box here, is defined by a set of at least 2 coordinates. In this case the rectangle where the line between those 2 points is the diagonal. For this example we&apos;ll look for an airport in the UK. I formed a polygon using Google Maps. I could have used France for this example, but the borders were too complicated. Now that I think about it, I probably should have chosen the state of Colorado. Laravel Scout 3.0.5 added the Macroable capability to the builder. This is a great way to add new method to a class without overriding it. A good place to add your custom macros would be in the boot method of your AppServiceProvider. I created a little project to gather useful algolia-specific macro. Feel free to contribute! This tutorial is only a small example of what you can do with Scout and Algolia. If you have any suggestions or if you want to share your use case, feel free to leave a comment or join our community. I&apos;ll be happy to answer.